WAYNE, MI April 24, 2015– Ford Motor Company announced yesterday that it will cut a shift at its Michigan Assembly Plant in Wayne, where it currently produces its Focus and C-Max crossover. The announcement comes as Ford says demand for hybrids and compact cars is in decline. The layoffs are expected to start around June 22. In total 700 workers will be laid off, with 675 of them being hourly UAW members. But Ford-UAW President Jimmy Settles says many of those displaced workers will be back to work elsewhere by the end of summer. “Fortunately, through collective bargaining we have been able to negotiate provisions throughout the years that allow protections for our members adversely affected by production reductions,” Settles said in a statement. “It is expected that nearly all of the displaced members will return to active employment at other southeast Michigan locations. Some, as soon as this summer, and all by early 2016. 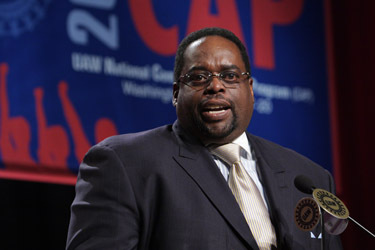 “The UAW has a successful history of negotiating layoff, transfer and job security provisions that have protected tens of thousands of workers in our history,” Settles said. The UAW will enter major negotiations with the Big Three automakers this summer, as all automotive bargaining agreements are set to expire in September. This entry was posted on April 24, 2015 by WMALC in Michigan labor news and tagged UAW, Wayne.